The polenta in these waffles really adds a lovely flavor and texture. With the berry sauce it was like a little pieces of heaven. Combine the dry ingredients in a medium-sized bowl. Mix the egg replacements into a second medium-sized bowl and beat until frothy. Drizzle in the soy milk. Add the liquid mixture to the dry ingredients, along with the melted soy margarine. Mix with decisive strokes from the bottom of the bowl, until all the dry ingredients have been moistened. Place the mixed berries in a saucepan. Add the water, sugar, cornstarch and cinnamon. Stir well to dissolve the cornstarch. Place on a low heat to simmer until the berries soften and the sauce thickens. 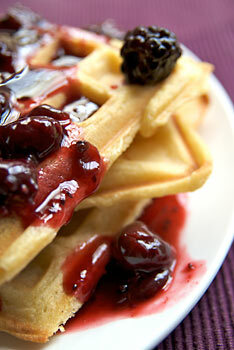 Lightly spray the hot waffle iron on both the top and bottom surfaces with nonstick spray. Add just enough batter to cover the cooking surface-approximately 1/2 cup for a standard waffle (1 cup for a Belgian waffle). Cook for 2 to 3 minutes, depending on your waffle iron. Don’t over-bake – you want it crisp and brown but not too dark. 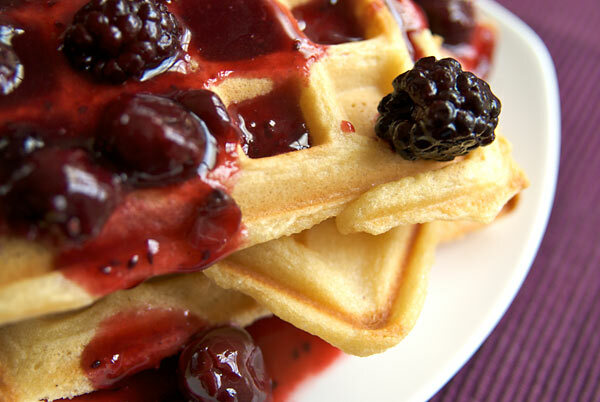 Place the berry sauce on the waffles and enjoy. Posted by Chris Walker on February 28, 2008 in Breakfast, Desserts and Sweets, Polenta.